(nee Houlihan) passed away peacefully February 9, following an extended illness. She was 84. Visitation will be held at St. Matthew Catholic Church, Franklin, 9:30-11 a.m., February 15, followed by the funeral Mass. 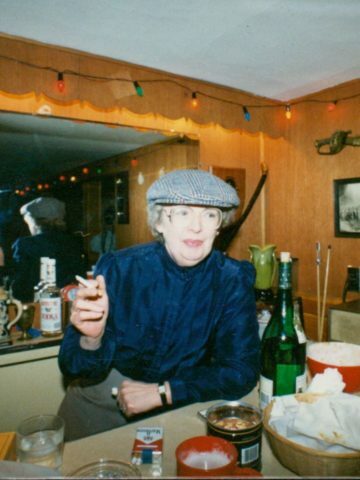 Miss Pat was the ultimate combination of fire and brimstone and kindliness. She was stern ( warranted when Tom and I were teenagers) and as compassionate as could be in all of our circumstances. Through the years, she was a blessing to me and my family. Always had an open door (and ice cream for my kids :)). My children, wife and myself loved her as the giving person she was. They say only the good die young. Not in this case. We will miss you Miss Pat. Pat was a good friend . We worked together for many years, from the childrens dept. at Castner-Knott to Macy’s. RIP my friend. Miss Pat was not just my dad’s best friend’s mom she was like a grandmother to me and my siblings. Her door was always open with snacks, candy and ice cream even if you didn’t finish your dinner. She was an amazing women with a kind and generous heart but with also a little fire in her soul. The kind of women that could put a smile on ur face any time you needed it but also the kind of women who you wouldn’t dare talk back to. Through the time she was sick she was still the same sweet lady that I always remembered still asking me if I wanted anything to drink or anything at all. Though she may have forgotten that she had asked me and continued to ask me but to me that just continued to show the kind of person she was, kind, sweet, generous, and loving. The kind of person that I loved and will miss. Miss Pat was more than my dad’s nest friend’s mom. She was a woman who was like a grandmother to me and my siblings. Her door always open with snacks, candy, and ice cream even if we didn’t finish our dinner. She has a sweet and kind heart, but also had a little fire in her soul. She was the type of person who was there to make you smile any time you needed but also the type who you wouldn’t dare talk back to. Through the time that she was sick she was still the sweet lady that I remembered. She was still asking me if I wanted anything to drink or anything at all. she may have communed to ask because she forgot she already did but I think that just shows the type of person sh was, kind, sweet, generous, and loving. The kind of person that I loved very much and will miss.